Wisconsin Dog Bite Laws | Hupy and Abraham, S.C.
Wisconsin state statutes include a specific law that is commonly known as the dog bite law. 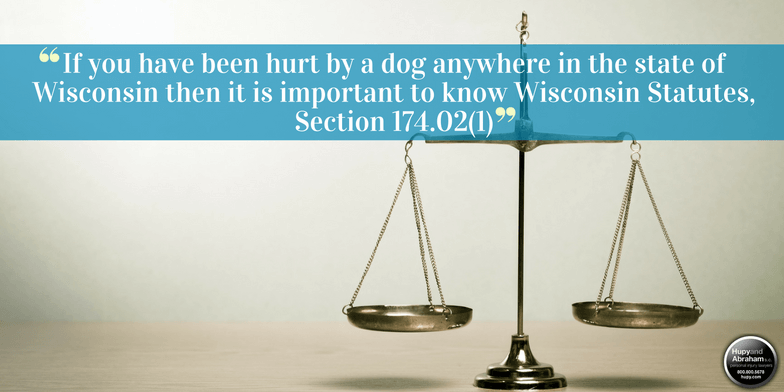 If you have been hurt by a dog anywhere in the state of Wisconsin then it is important to know what Wisconsin Statutes, Section 174.02(1) says about liability and about your potential recovery. (a) Without notice. Subject to s. 895.045 and except as provided in s. 895.57(4), the owner of a dog is liable for the full amount of damages caused by the dog injuring or causing injury to a person, domestic animal or property. (b) After notice. Subject to s. 895.045 and except as provided in s. 895.57(4), the owner of a dog is liable for 2 times the full amount of damages caused by the dog biting a person with sufficient force to break the skin and cause permanent physical scarring or disfigurement if the owner was notified or knew that the dog had previously, without provocation, bitten a person with sufficient force to break the skin and cause permanent physical scarring or disfigurement. Generally speaking, part A establishes strict liability for dog bite injuries and makes the dog owner responsible for paying full damages to the dog bite victim, and part B explains when a dog bite victim may recover double damages for his injuries. Further sections of the same statute go on to explain the penalties that may be imposed against a dog owner, when a court may order that a dog be killed, and special rules for law enforcement dogs. While the law may seem straightforward, insurance companies always look for exceptions to the rule and may try to deny your claim or pay you as little as possible for your damages. Accordingly, it is important to begin protecting your rights and potential recovery as soon as possible. You can get started right now by browsing our website for more tips and resources about your dog bite case or by starting a live chat with us at any time.